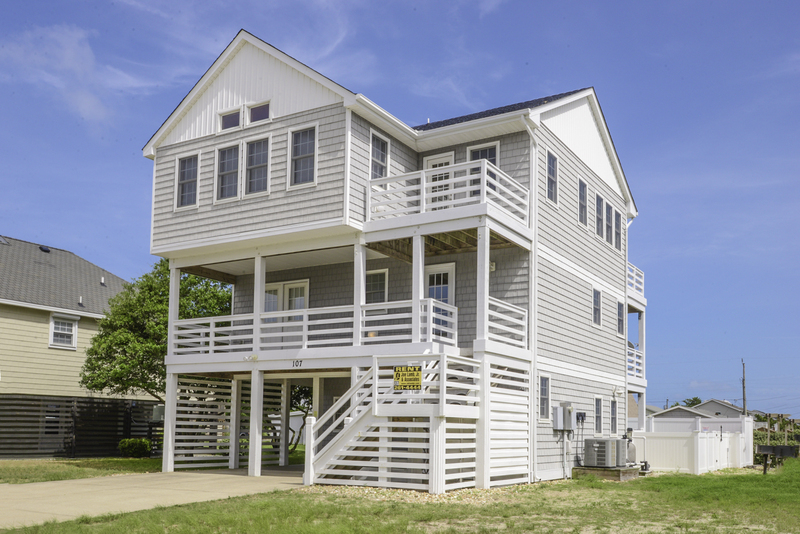 This Lovely Kill Devil Hills Vacation home is located approx. 2 blocks away from two (2) Beach Accesses in a Quiet, Peaceful Neighborhood, making it great for Families w/ Small Children. Views of the Ocean & Wright Brothers National Monument complete the Long List of Amenities that are sure to Make this the Right place at the Wright Time for you & yours. Ground Level: Parking, Covered Entry, Rec. Room w/Surround Sound, Flat Screen TV, VCR, DVD, Wet Bar w/Mini Refrigerator, Microwave, Ice Maker, Phone, Full Bath (Shower Only), Bedroom w/King, Flat Screen TV, & Phone, Access to Private Swimming Pool, Hot Tub, Basketball Goal, Enclosed Outside Shower, & Charcoal Grill. Mid Level: 3 Bedrooms (1 Master Suite w/King, Flat Screen TV, Full Bath w/Shower & Tub), & 1 w/Queen, Flat Screen TV, Phone & Access to Covered Deck, 1 w/ Duo Bunk w/Trundle, Flat Screen TV, & Access to Covered Deck), Shared Full Bath w/ Tub & Shower, Laundry w/Heavy Duty Washer & Dryer. Top Level: Living/Kitchen Area, Dining Room w/Table w/8 Chairs & Island Bar w/3 Bar Stool Chairs, Vaulted Ceilings, 51 Inch HDTV w/Blue Ray & Home Theater System, IPod Dock & Free Netflix, Half Bath, 1 Master Suite w/King, Flat Screen TV, Phone, & Full Bath w/Double Sink, Tub & Shower & 2 Sun Decks. Features include: C/AC & Heat, Washer/Dryer, Dishwasher, Microwave, TVs, VCR, DVDs, Wireless Internet, Baby Equipment (High Chair, Pac-N-Play, & Child Gate), Ceiling Fans, & Deck & Pool Furniture. No Pets. This is a Non-Smoking Unit. General Condition of property is good and likely to return. Very quiet neighborhood which we enjoyed. The house was very accomadating to our needs. This house was great! There were 11 of us, 6 adults and 5 kids and we had plenty of space. The beach is a short walk away. Shopping, dinning and other activities are also very close and convenient. Wright Time is a beautiful house, well maintained and in an excellent location. The pool is perfect for the kids and the hot tub is great for the adults. We love all the porches. We absolutely loved this house. Wright Time is a beautiful house, well maintained and in an excellent location. The pool is perfect for the kids and the hot tub is great for the adults. We love all the porches. The house was absolutely beautiful. The layout was perfect for our family. Love the pool and hot tub. And the location was perfect. Had a great vacation. Everything in top condition. Have rented from Joe Lamb, Jr for years and have never been disappointed. The pool and hot tub was wonderful!